This unit is intended for use in offices with 5 to 10 people, where 500 to 2,000 sheets per day are shredded. Multiple units can be purchased through OREweb.ca® at government rates for bulk orders and for multi-office users. Other models below have higher capacity or volumes for department and centralized needs. Dimensions 11 3/4" x 15 1/2" x 25"
This model is constructed with a durable solid laminated wood cabinet on casters for easy movement when required. With its high security document destruction capabilities, it can be used for Federal, Provincial and Military / Department of Defence applications for low to mid volume paper shredding. SPS® (Safety Protection System) package: electronically controlled, transparent safety shield in the feed opening. Automatic reverse and power cut-off (avoids paper jams). Automatic power cut-off when shred bag is full or when cabinet door is opened. ESM® (Energy Saving Mode) after 1 hour of inactivity. Exceeds RCMP / Canadian Government approved shred size security standards rating. High quality, hardened steel cutting shafts. 1 year warranty on the cutting shafts. Environmentally friendly reusable plastic bag. 9 1/4 gallon shred volume. 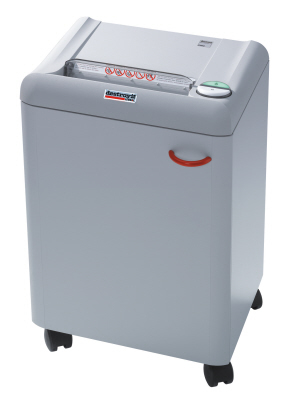 HSM Classic 125.2 HS L6 Cross-Cut Shredder offers RCMP rated document destruction with a large 20 gallon waste bin capacity and built in automatic oiler. HSM SECURIO B34 HS L6 Cross-Cut Shredder is a medium duty shredder for medium to large office shredding needs.